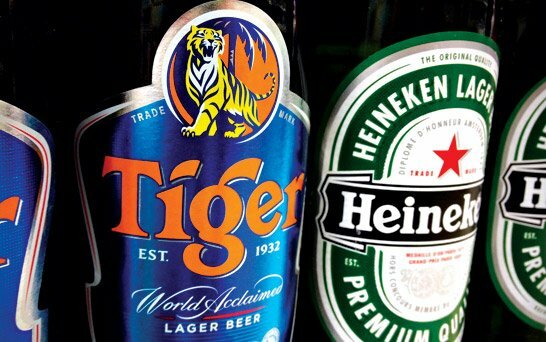 Heineken has agreed to buy Fraser and Neave’s controlling stake in the maker of Tiger beer in a deal worth 5.6 billion Singapore dollars (US$4.5 billion). Heineken had raised its bid, from 50, to 53 Singapore dollars per share. On Saturday, Singapore-based Fraser and Neave confirmed it had accepted an improved offer from the Dutch brewer for its 40% stake in Asia Pacific Investment Pte Ltd (APIPL). Fraser and Neave shareholders still need to approve the deal in a vote. APIPL is a joint venture between Heineken and Fraser and Neave which operates Asia Pacific Breweries (APB). As well as Tiger, APB brews a range of other well-known Asian brands such as Anchor beer, Baron’s Strong Brew, ABC Extra Stout, Archipelago beer and Bintang beer. If approved, the deal would give Heineken an 81.6% stake in APB triggering an automatic takeover offer for the outstanding shares in the company which would cost a further 2.5 billion Singapore dollars. As part of the deal, Fraser and Neave has promised not to “solicit, engage in discussions or accept any alternative offer or proposal” for its interests in APB. This clause refers to a rival bid from the family of Thai billionaire Charoen Sirivadhanabhakdi who had made a 55 Singapore dollar per share offer for a smaller stake in APB. Charoen Sirivadhanabhakdi controls Thai Beverage (ThaiBev) South East Asia’s second biggest brewer behind San Miguel of the Philippines. ThaiBev is also Fraser and Neave’s biggest shareholder with a 26.4% stake making it a major power broker in the coming shareholder vote.